You have to love a news story that starts with “Lady Gaga probably won’t tweet about it.” And it’s true, she probably won’t alert her adoring fans that a six-mile stretch of the 710 freeway will be closing this weekend – and nine subsequent weekends after. Wondering why this isn’t Carmageddon Part 2? Mostly because the freeway will only be closing during late night hours, for shorter periods of time and it’s simply a less traveled road than the 405. The closure is part of a $700-million Caltrans pavement and safety improvement project. Personal Rapid Transit, or PRT, often comes up in discussions of urban transit – and is often derided as something best for airports and theme parks by transit pros. Transit pro Richard Gilbert takes a look at the history of PRT – from a number of studies in the 1960’s that never bore an actualy PRT system to a similar-but-different Group Rapid Transit system successfully implemented in West Virginia – and wonders whether it isn’t time to take another look at the concept. Mark Noad's revised Tube map brings a few curves to the London Underground. The iconic London Tube Map has been in the news lately, thanks to a study that showed that the map’s bold and influential design actually leads a big chunk of riders astray and on longer rides than they need to take. 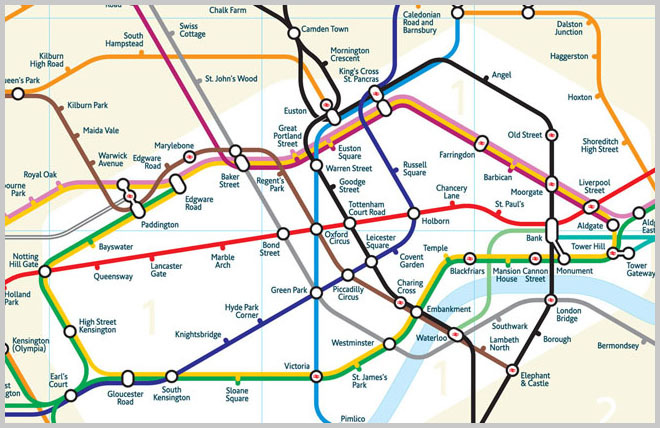 In comes Mark Noad, a designer who has taken a stab at updating the Tube map for the modern world. He forgoes the original map’s strict geometric rules and reintroduces geography into the cartography. The result? Not quite as pretty, but perhaps more useful. This story got me thinking about our own Go Metro Map, it’s obviously inspired by Harry Beck’s original Tube map with strict 45 and 90 degree lines and a lack of geographic features, but does it effectively communicate how Metro Rail interacts with the larger city? Could it use a reboot, shedding it’s Tube-inspired skin?